You don’t want to file your green card renewal too early or too late. In fact, both ways can cause problems for permanent residents. Instead, file your renewal application just in time. When is the right time to renew a green card? A green card, formally known as a permanent resident card, is proof of your permanent resident status in the United States. It also serves as a valid identification document and proof that you are eligible to live and work in the United States. It’s important to keep your card up-to-date. Without a valid card, it may be difficult for you to prove that you are a permanent resident, and this could also affect your ability to reenter the U.S., accept employment, and take care of other important responsibilities. Employment: A green card provides proof of your right to work in the U.S. Employers are required to check. Travel: Valid, unexpired proof of permanent residence is required to re-enter the United States after traveling abroad. Driver’s License: Most states will not renew a driver’s license without a valid, unexpired green card. Home Mortgage: Home lenders require proof of permanent residence when you purchase a home or re-finance. For more details about these issues, read our related article — Expired Green Card Creates 4 Big Problems. Avoid the hassle. Enter your expiration date, and you’ll get an email reminder when it’s time to renew your green card. USCIS has indicated that your application may be rejected and returned to you if you file Form I-90 for a renewal more than 6 months prior the expiration date. This will cost you valuable time and money. Therefore, your best course is to file Form I-90 in a 30-day window that is 5-6 months prior to the expiration date of your current green card. Need help? CitizenPath’s online process will help you complete your Form I-90 in about 15 minutes. Try it now. CitizenPath helps you prepare Form I-90 by providing step-by-step instructions that save you time and avoid costly delays. CitizenPath even provides alerts if you answer a question in a way that might be a problem. It only takes about 15 minutes, and you’ll be able to file Form I-90 to renew your green card today. Plus, we guarantee that USCIS will accept your application. Can I pay to expedite my green card renewal? No. USCIS does not offer any program to expedite or rush your application for a green card renewal. Further, no lawyer or immigration consultant can offer a way to rush your application. If you need your green card renewed as soon as possible, the best thing you can do is ensure your application is complete and accurate. CitizenPath will help you prepare your application in about 15 minutes, and we guarantee that USCIS will accept it. Give it a try. Can I travel abroad with an expired green card? Valid, unexpired proof of permanent resident status is required to re-enter the United States. A Customs and Border Protection (CBP) officer may deny you entry if you attempt to re-enter the U.S. with an expired green card. This could result in expensive legal bills. In the best case, you will be allowed to re-enter after paying an expensive re-entry fee and a long delay. If you must travel before your new green card arrives, there is a solution. Read Expired Green Card Creates 5 Big Problems to learn more. What should I do if I'm outside the United States when my green card expires? If you are outside of the United States with an expired card, you can (in most cases) return to the United States. Most transportation carriers (e.g. airlines) will allow you to board vessels bound for the United States with an expired green card. However, you may still be required to pay a reentry fine when you reach U.S. Customs and Border Protection at a port of entry. Check with your airline or transportation carrier to confirm they will allow you to board with an expired green card. If not, you may need to file Form I-131A, Application for Travel Document (Carrier Documentation). Should I tell my current employer that my green card is expiring? No. Unless they ask, there is no reason to inform your employer that your green card is expiring or expired. However, if they ask you to provide current proof of your employment authorization again, you will need to provide your unexpired green card. Likewise, you’ll need to show your green card if you suddenly need to start a new job. When filing Form I-90 to renew your green card, you’ll need to pay a USCIS filing fee of $455 plus a biometrics fee of $85. The total USCIS fees are currently $540. 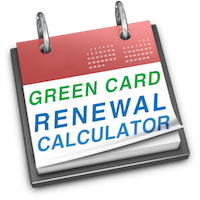 The process to renew a green card generally takes about 5-6 months. Processing times vary based on the workload at each USCIS location and your particular case. You can check USCIS Processing Times. If you are traveling abroad, starting a new job or even renewing a driver’s license, this can be a big problem. But when you appear for your biometrics appointment, USCIS may provide you with a sticker to extend the validity of your green card. Learn more about What Happens After Filing Form I-90. Is there a penalty if my green card expires? No. 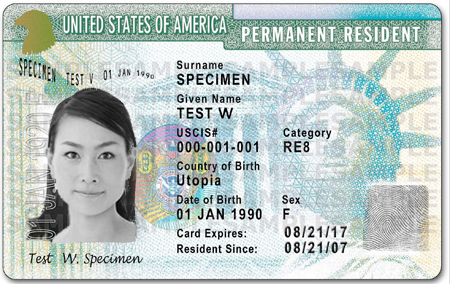 There is no penalty if your green card expires before you can renew it. Technically, you are required to carry a valid green card by law. However, most people will only experience the inconvenience of not having valid identification for accepting employment or traveling abroad. The documents that you submit with Form I-90 vary based on your answers in the Form I-90 application. Generally, most people will need to submit the USCIS filing fee and a copy of your existing green card. What if I am a conditional resident and my green card is expiring? If you are a conditional permanent resident through marriage to a U.S. citizen, you will not use Form I-90. Instead, file Form I-751, Petition to Remove Conditions on Residence, in the 90-day period before your card expires.